I visited Central Australia 16 years ago and the memory of it still remains vivid in my mind. I’ve painted this encounter now, using the bright colours of the Uluru and Kata Juta areas. These are monumental rock features and are Australian icons. My painting approach is abstract in style…it’s almost impossible to express the spirit and wondrous nature of these edifices any other way. The colour is high and vivid with reds, oranges and pinks and a splash of yellow. I’ve indicated features such as sky with a bright blue and remnant trees and small rocks in dark tones. My memory evokes feelings of appreciation of the grandeur of these places….I’m trying to capture the essence, the spirit of Uluru and the surrounding landscape. Hope those who have experienced this part of Australia (and those who would like to) can somehow connect with the essence of what I’ve painted. 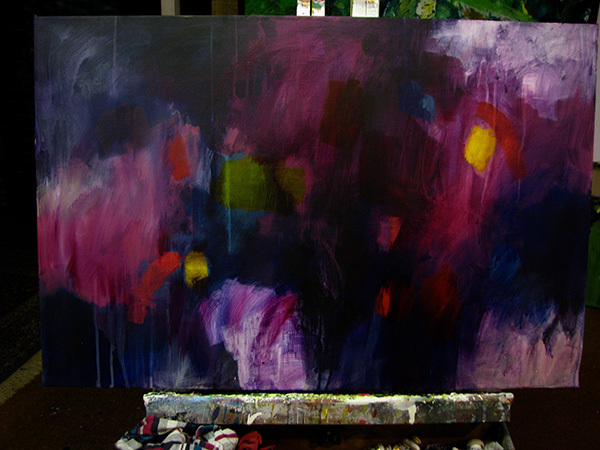 The “Alchemy” series continues on with work progressing on a new painting. These newest works are painted on linen which creates a richer painting experience and is a more flexible surface that can be rubbed over and receives washes in a better responsive way. After using canvas previously, I’m reluctant to go back to it! I’ve taken a pic for you to see….should be complete soon. The colours are deep and mysterious pinks, purples and blues with hints of brighter hues.